I. Introduction: White apple leafhopper (WLH) is the most important leafhopper on apple. This species is a native insect in the eastern states, now distributed throughout fruit-growing regions of North America. Its importance has increased in recent years as a result of resistance to organophosphate insecticides. II. Hosts: Apple is the main host, but this species may be collected from related trees (e.g. peach, cherry, plum, hawthorn) in the second generation. `Empire' and `Liberty' are relatively susceptible to WLH. III. Description: Adults are white, forming an elongate wedge about 1/8 inch (3-4 mm) long (Plate 57). Adults fly when disturbed. 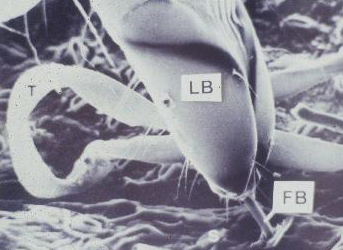 Nymphs are also white (sometimes very pale yellow or green), and are much smaller, less than 4/100 inch (1 mm), when they hatch from eggs near petal fall (Plate 58). They move less readily than nymphs of potato leafhopper. A similar leafhopper, the rose leafhopper, sometimes appears in apple trees. It is most readily distinguished in the nymphal stage. Rose leafhopper nymphs bear a series of small black spots on the thorax and wingpads (Plate 59). Adults are distinguished by genitalia differences. IV. Biology: WLH overwinters in the egg stage. Eggs may be seen as longitudinal swellings on 1-5-year old wood (about pencil-diameter). Nymphs begin to emerge about the pink stage, and hatch is usually complete by petal-fall, although it may be somewhat more protracted. There are five nymphal instars; shed skins from earlier instars may be found clinging to the underside of the leaf since nymphs generally wander little. Nymphal development takes about 30 days in the first eneration. Adults from the first generation appear during late May and usually peak in mid-June. These adults oviposit in leaves, inserting eggs into leaf petioles and midribs. Second generation leafhoppers are present from early August through the fall. Nymphal development of this generation takes about 20 days. Rose leafhopper overwinters on multiflora rose and brambles. There are three generations; the first generation develops on the winter hosts. Adults disperse to apple in early June. A generation of nymphs develops of apple during early July, becoming adults in early August (incorrect timing for WLH). The third generation develops during late August, becoming adults in late September (overlapping development of WLH). An egg parasite, Anagrus epos Girault, overwinters inside the eggs of WLH and also attacks eggs during the summer. Predatory mirids may attack nymphs, especially in the second generation. V. Injury: Nymphs feed on the underside of mature apple leaves. Adult feeding is not considered as important because adults feed for shorter intervals of time and the stylets do not penetrate into the leaves as far as nymphal stylets. Stylets are inserted through mesophyll tissue up into palisade cells. Feeding occurs in 1-2 of the 2-3 cell layers of this tissue. Feeding sites are associated with white stippling visible on the top of the leaf (Plate 60). 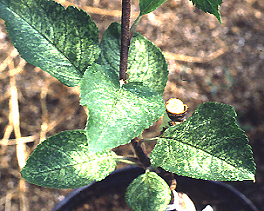 Visible injury can range from light stippling along the midrib to complete chlorosis. The stylets radiate in several directions from the point of insertion, therefore substantial stippling may be associated with a relatively low number of feeding sites. Stippling may give an overly severe impression of the impact of feeding, because white areas result partly from reflectance of light by air that has entered damaged areas, not simply from removal of leaf tissue. Heavy injury, especially under high crop loads, can result in downsizing of fruit. Honeydew can also cause black speckling on the surface of the fruit (Plate 61). Injury by rose leafhopper is thought to be similar to that of WLH. VI. Monitoring: Examine the undersides of randomly selected leaves during the period for petal fall through first cover. Count the number of nymphs per leaf on 10 leaves per tree, from at least 4 trees per block. Since eggs overwinter on the tree and nymphs do not disperse readily, there will be little population buildup during the course of the first generation. Research at VPI&SU has shown that WLH feeding in the first generation causes little, if any, reduction in fruit size or quality at population densities up to four nymphs per leaf (the highest level tested). The action threshold is 3.0 nymphs regardless of crop load. For second generation populations, examine the undersides of randomly selected leaves during August. Count the number of nymphs per leaf on 10 leaves per tree, from at least 4 trees per block. Since second generation is more protracted, monitoring will have to be performed for a longer period. Thresholds for the second generation are provisional (see comments under "Bloom to fruit set"). An action threshold of 3 nymphs per leaf under high crop loads is recommended during this generation; leafhopper feeding under light crop loads can probably be tolerated at this time unless high populations present an undue nuisance to pickers. WLH has been blamed for transmission of the shoot blight phase of fire blight, but no support was found for this in research trials. However, some evidence was presented for such a role for potato leafhopper. See the Michigan State Univ. and Cornell factsheets. Beers, E. A. Elsner and S. R. Drake. 1995. White apple leafhopper (Homoptera: Cicadellidae) effect on fruit size, quality, and return bloom of apple. J. Econ. Entomol. 88: 973-978. Pfeiffer, D. G., J. C. Killian and K. S. Yoder. 1999. 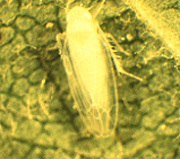 Clarifying the roles of white apple leafhopper and potato leafhopper (Homoptera: Cicadellidae) in fire blight transmission in apple. J. Entomol. Sci. 34: 314-321. Welker, R. M., R. P. Marini and D. G. Pfeiffer. 1995. Influence of first-generation white apple leafhopper (Homoptera: Cicadellidae) and leaf-to-fruit ratio on apple fruit size and quality. J. Econ. Entomol. 88: 959-964. Welker, R. M., R. P. Marini and D. G. Pfeiffer. 1996. Ultrastructural and surface features of apple leaves following white apple lefhopper feeding. HortScience 31: 249-251.